My dinner tonight? 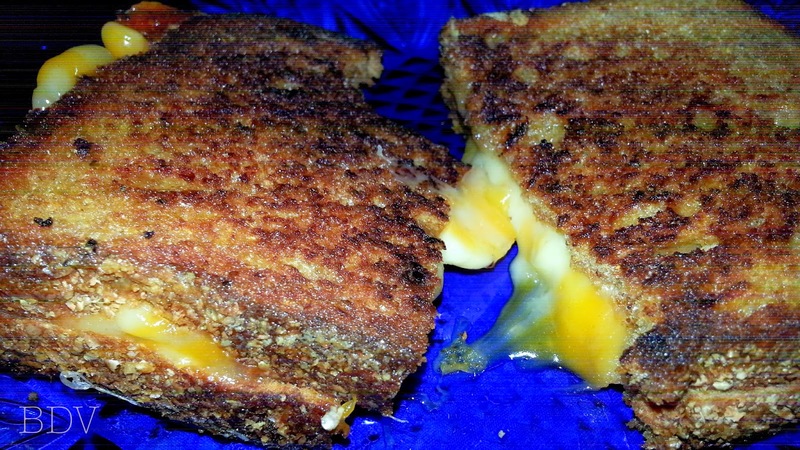 A grilled cheese sandwich, but not just any grilled cheese. Mine is made with a creamy colby-jack cheese AND smoked gouda. Delicious. Since it is now about 10:30 at night, and I just finished eating and am still working, you can imagine that a very late dinner would have to be quick and easy. Grilled cheese to the rescue with a side of sweet peppers and a small cup of orange-carrot juice for dessert. The healthier sides justify my not-so-healthy dinner, even if it is an adult-version. To graduate the grilled cheese to a doctored-up grown-up version, I swap out the American cheese altogether. I don't care much for it and much prefer a blend of more "premium" cheeses. Swiss is another favorite. If I had more time tonight, I would have also grilled some onions to stick inside of my sammy. It is one of the most marvelous grilled cheese ingredients you can add. Growing up, my mom would add a slice of ham or turkey, depending on what we had on hand, or even a slice of tomato. The only tomato I had in my fridge is an heirloom, which is being preserved for a salad. What are your favorite go-to meals? Are there any "kids" meals that you doctor up to make your own? I'd love to read about them in the comments.